This post is an attempt to come up with a Law on the fundamental nature of power, which I call ‘Aragorn’s Law’. To begin with, we state three propositions. It’s possible to define the concept of power in a few different ways, but for the most part, when we think of someone who is powerful, we think of a person who has control, meaning they can make choices. A horse remains a ‘strong’ animal even with a rider on its back, but it is no longer powerful, when it is wholly under the control of the rider. That’s because the rider can steer the animal, bending its force to his human will. In a sense, a skilled rider assumes the strength of the beast he controls, taking from it its power. The same principle holds in human relationships too. Powerful people are those who have control over others, who can make choices and enforce their will upon their subordinates. The boss of a company, the mother of a child, the leader of a country, the dominant spouse in a marriage – these are all clear examples of people who have control over other people and are thus powerful. For simplicity’s sake, let’s just call them kings. What we’ve said so far is nothing very earth shattering. In fact, it’s pretty close to tautological. Ditto for what I’m about to say concerning a ‘good’ person: A ‘good’ person is one who tries to do good. This is pretty uncontroversial, unless you take the position that goodness is something innate – i.e. that you simply are (or are not) good or else the nihilist position, that good does not really exist, and that there is only subjective self-interest. 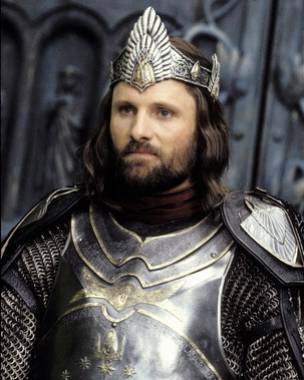 Tolkien’s fictional king Aragorn is the archetype of the powerless ruler – slave to his desire to do good. But if you accept – as I do – that there is such a thing as free will, and that there is such a thing as objective ‘goodness’, then it follows pretty logically that a good person is one who makes the choice to do good things; and a good king is a king who chooses to do good. The boss can do good by paying his workers fairly, setting an example of industry and honesty and settling disputes in a tough but equitable way. The mother can give to her children equal shares of love and attention, care for their needs and protect them from harm. The political leader can attempt to reform his country, restrain the power of the oligarchs and promote the prosperity of his people. Even the dominant spouse can do good, by refraining from using her power over her partner in an adverse way and by guiding him to be a stronger, better individual. Now follows the final proposition in the argument: If there exists such a thing as good, then there exists its logical extreme, ‘best’. Insofar as achieving ‘best’ requires choices, there is one path (though often unknown) which is always the Best Path to achieving it. This is a little more tenuous, I’ll admit. You might argue that there could be two equally good outcomes, in which case there might be two separate paths to get us there. But in general, I believe the proposition to hold in most cases, if not in all. It is ‘good’ for the people to be enfranchised, educated, live in peace and pursue their own goals, and there is one ‘best’ outcome for them, their families and society. Even if a king is benevolent, he might not know exactly what the path is to achieve these goals, but he knows that among all the choices he could make, there is one unique set of choices which will guide him and his people as close to this goal as is possible. In a world free of morality, a king might have infinitely man choices, but Proposition Three reduces his choices to two: Either he follows, to the best of his ability, the path of good, the Best Path, or he does not. This is so because in order to do good, a king is infinitely constrained in his actions. Every choice he faces is, in effect, a choice between staying on the Best Path, or deviating from it. As long as he always remains on the Best Path, he has no control whatsoever and is, according to Proposition One, effectively powerless. A restatement of Aragorn’s Law is instructive in how we view the role of a leader. If power and good leadership are contradictory, then anyone who seeks to have power, cannot be good. This gets us to the fundamental problem with politics, which is that we are ruled by the powerful. It is worthwhile for all of us – and particular those of us in positions of authority, to reflect on what it means to be a good king, a good boss, a good parent or even a good friend. You are never free to do what you want, if freedom to choose means the freedom to deviate.